I love the hills and valleys you find in the Ozarks. The grand vistas, the fall colors, and the dappled sunlight as it falls into the hidden forest places all give a sense of adventure and fun to the viewer. You can lose yourself there and feel removed from anything but the wonderment around you. I am also fascinated with mountain life; both the people who live in these “places apart” and the “critters” that share in their existence. “Mountain Mischief” is my vision for this way of being. 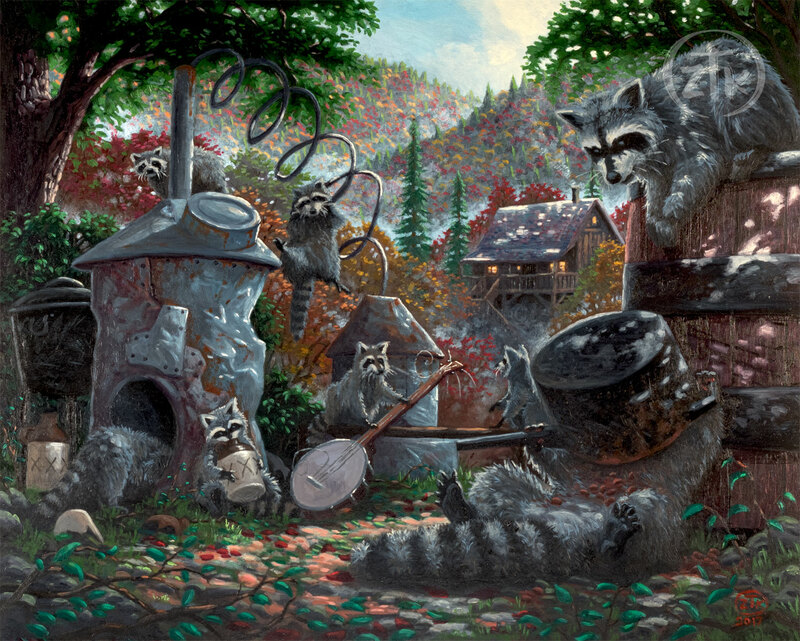 In it, a gaze of raccoons plays merrily with some old equipment left unattended by the folk of their “hallow”. Whether by starting a “jug band” or by investigating their new-found spoils, this rollicking group is assured to wind up finding trouble from their behavior. I can almost hear the shouts coming from the distant cabin as the ring-tailed “party” is discovered. And, I see the commotion that ensues as the evening shadows swallow this mischievous menagerie scurrying away and leaving a trail of chaos behind. In “Sunlight” or with “Moonshine”, I hope my Ozark Mountain story makes you smile each time you take a moment to visit. And, as always, thank you all for sharing my adventure in art.